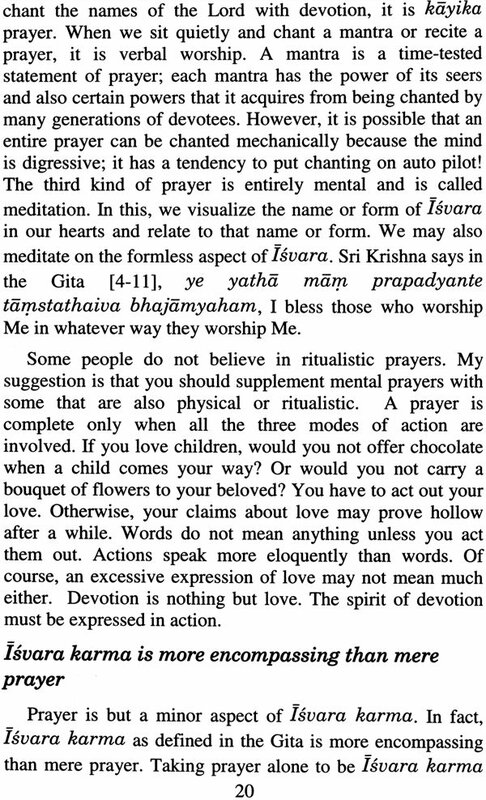 In these pages, Swami Tattvavidananda explores the nature of bhakti or devotion for the Lord and the crucial role it plays in one's life. 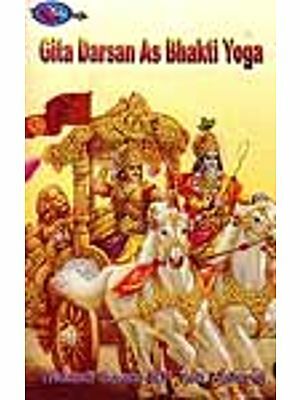 In the context of this teaching, he takes up eight specific verses from the twelfth chapter of the Bhagavad Gita, known as Bhakti Yoga. 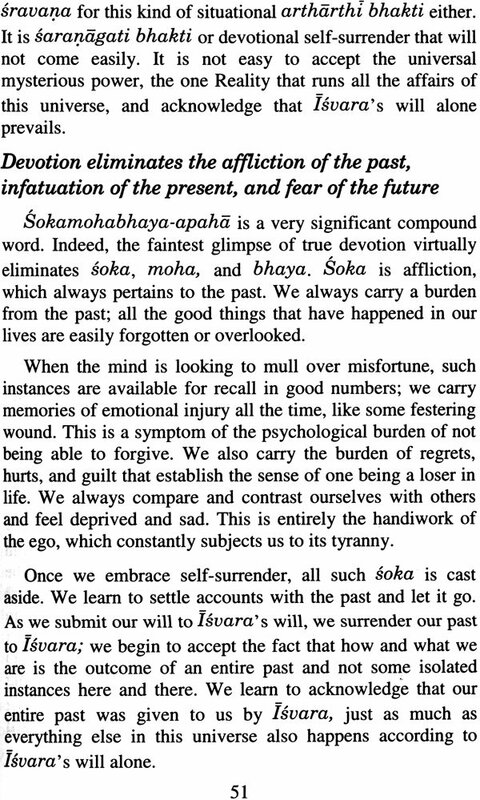 These verses mention various qualities exemplified by a true devotee, the bhakta laksanas, which endear the devotee to the Lord. 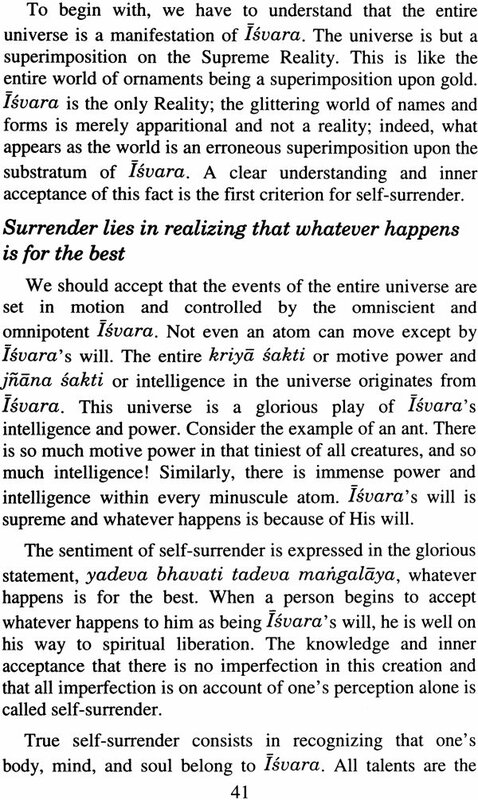 In the course of explaining these verses, Swamiji has also examined the relevant parts of Sri Sankara's commentary on this chapter in great detail. Swamiji teaches that having devotion or love for the Lord transforms karma and janana into karma yoga and janana yoga. 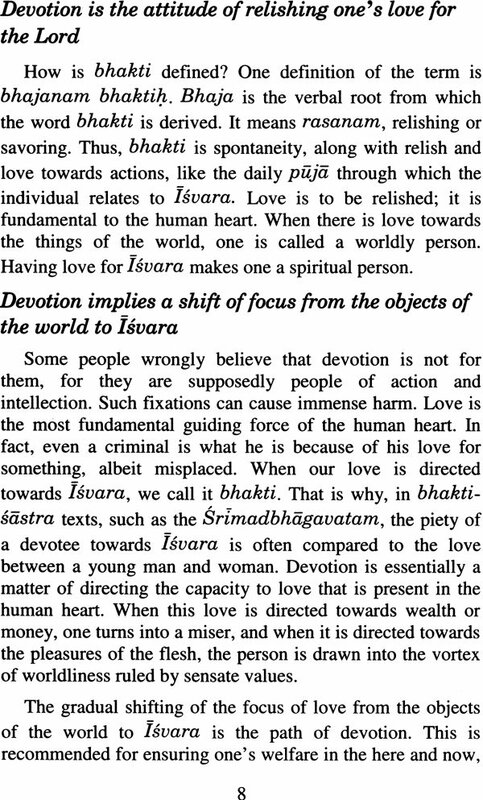 Such love purifies the mind and helps us maintain an appropriate attitude to life and overcome our preoccupation with the material objects of the world and focus upon Isvara. 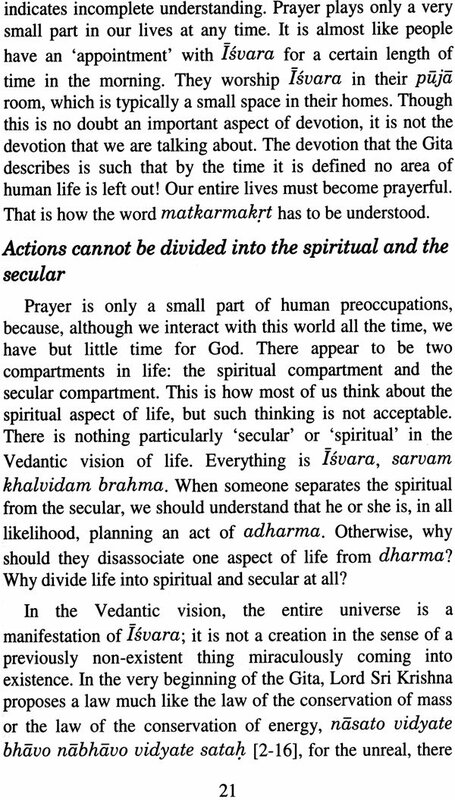 Swamiji describes the various forms of prayer and the various kinds of devotees, and shows how the fact of seeking is itself a denial of lsvara. 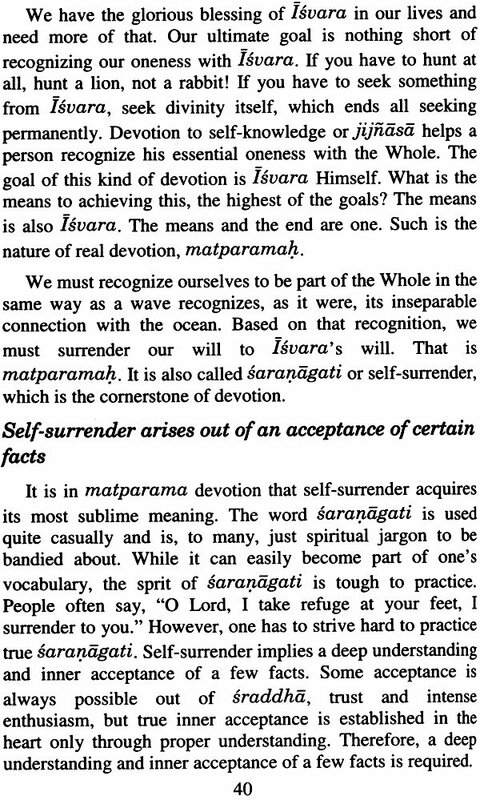 Devotion is defined as an indication of one's emotional growth and culminates in saranagati, the unquestioning acceptance of Isvara' s will and that it alone prevails. This book is one of the most detailed expositions on the characteristics of the true devotee, the janani bhakta. It is especially valuable because it is also a wonderful exploration of Sri Sankara's commentary on the topic. 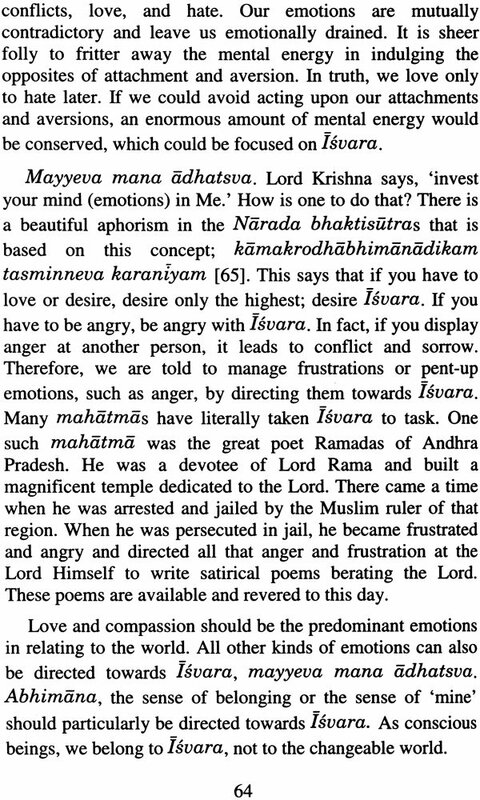 In these verses, the janani bhakta is depicted as an ideal and held up as a superb model of conduct. He is seen as a realized soul, who manifests all the bhakta laksanas quite effortlessly. 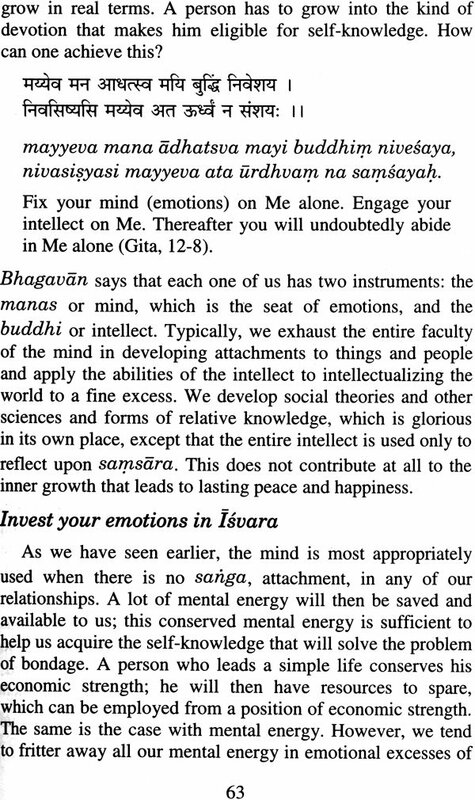 Swamiji shows us how masterfully Sri Sankara has interpreted each of these qualities. 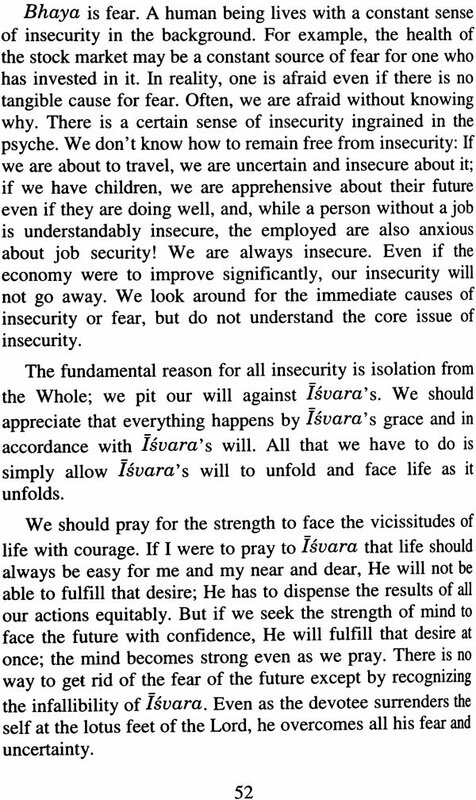 The reader will note that this sequential and precise delineation is no mere theoretical exercise; Swamiji also provides very practical suggestions that will enable the reader to emulate and assimilate these qualities in his own life. As one of the foremost teachers of Vedanta at the Arsha Vidya Gurukulam in Saylorsburg, Pennsylvania, Sri Swami Tattvavidananda considers non-attachment or dispassion to be the greatest principle of all. Here he teaches that the preoccupation with the material objects of the world must cease so that one may learn to appreciate the higher reality that transcends all names and forms. While his guidelines for practicing the qualities of a janani bhakta may seem strict to some, they will serve well to enhance our understanding of the topic. Each subsequent reading is sure to provide greater clarity of thought and appreciation of the teaching. Swamiji has meticulously transliterated the entire text with word-for-word meanings and ensured that the manuscript has been thoroughly examined and revised. 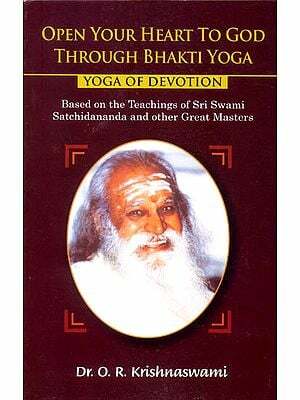 On behalf of all of Swamiji's students, and as his student myself, I offer my gratitude to him for having made this teaching available to readers everywhere. Sri Swamiji would like to acknowledge with reverence the inspiration he has gained from the works of Sri Swami Akhandanandaji Maharaj. He would also like to acknowledge the enthusiasm and affection of the students of the Arsha Vidya Gurukulam, Saylorsburg, PA, USA. I am sure that the reader will be able to appreciate and apply the valuable and practical insights in this book.